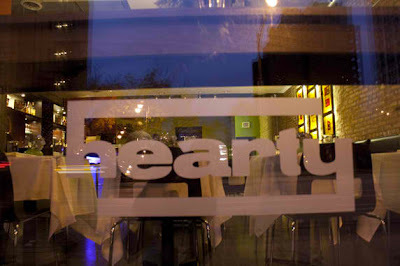 The Hearty Boys restaurant here in Chicago has taken my heart (and stomach) with their amazing weekend brunch. You may recognize the Hearty Boys Dan Smith and Steve McDonagh as the winners of the Food Network's "The Next Food Network Star" and the hosts of of the Food Network show "Party Line with The Hearty Boys." This being said their food didn't disappoint. The menu provides comfort food revisited with options such as gingerbread pancakes, chicken and waffles, and homemade biscuits with pumpkin butter...get the picture?